As part of efforts to push the spatial resolution of Chandra to the sub-ACIS-pixel regime, we have identified a feature in the Chandra/HRC point spread function within the central arcsecond which may affect high fidelity deconvolutions. There is evidence that the feature is also present in Chandra/ACIS data. The problem does not affect images on scales larger than one arcsecond. Chandra's Ultimate Angular Resolution: Studies of the HRC-I Point Spread Function by Michael Juda & Margarita Karovska. Refer to the Instrument Anomalies in the HRC section of the POG for additional unrelated issues with the HRC detector. There is an asymmetry in the HRC images at ~0.6-0.8" along the negative HRC V direction, which is also the negative CHIPY direction in HRC event lists. (Fig 1, Fig 3). The feature's brightness appears to be ~5% (and perhaps somewhat higher) of the total brightness. Residuals in 2D fits to ACIS data persistently show enhancements relative to the PSF in the +Z direction that are consistent with the PSF hook-like feature. A time series of AR Lac observations obtained almost yearly since October 1999 shows that the asymmetry (with its present characteristics) appeared sometime between October 1999 and December 2000 (Fig 1) and is present in the recent observations obtained in 2010 December. It appears to be stable since December 2000. Analysis of several ACIS images (SER, deconvolution, subtraction) indicate that there is an asymmetry in a similar direction and spatial scale as in the HRC images (Fig 4). The figure of panda counts ratios from Kashyap shows the asymmetry in the counts in the data along +Z compared to counts along -Z. The analysis of the ACIS data is more complex because of its coarser pixel scale and thus coarser sampling of the mirror+instrument PSF. If the asymmetry is indeed in the ACIS data as well then it would suggest that the origin of this asymmetry is in the HRMA mirrors. The CXC is continuing its investigation. The make_psf_asymmetry_region tool creates a region file that identifies the area where the asymmetry may be affecting the analysis (especially for a 2-D analysis looking for faint jets, shells, or similar structures). To obtain make_psf_asymmetry_region, download the CIAO scripts package (most CIAO installations will have this installed). Users should treat with suspicion any extent in their images at scales less than 1 arcsecond in a direction of 260-310 deg (in spacecraft MSC coordinates) with a flux less than 10 percent of the total brightness of the source. Two observations at different spacecraft rolls will be advisable for searches for shells or jets at scales of less than 1". Simulations suggest that encircled energy analyses would show detectable effects of this asymmetry for sources with several hundred counts or more. Refer to the ChaRT issues and caveats page for general information about the Chandra PSF. The CXC is carrying out analysis of point source observations with HRC and ACIS to characterize the asymmetry and its origin and temporal evolution. Simulations with a distorted HRMA are being carried out in an attempt to replicate and model the asymmetry. Additional 20 ks observations of AR Lac have been scheduled in Chandra Cycle 13 for calibration purposes. In the longer term, if the asymmetry is confirmed to be in the HRMA, the HRMA PSF model will be improved and made available to the users via ChaRT/SAOTrace. 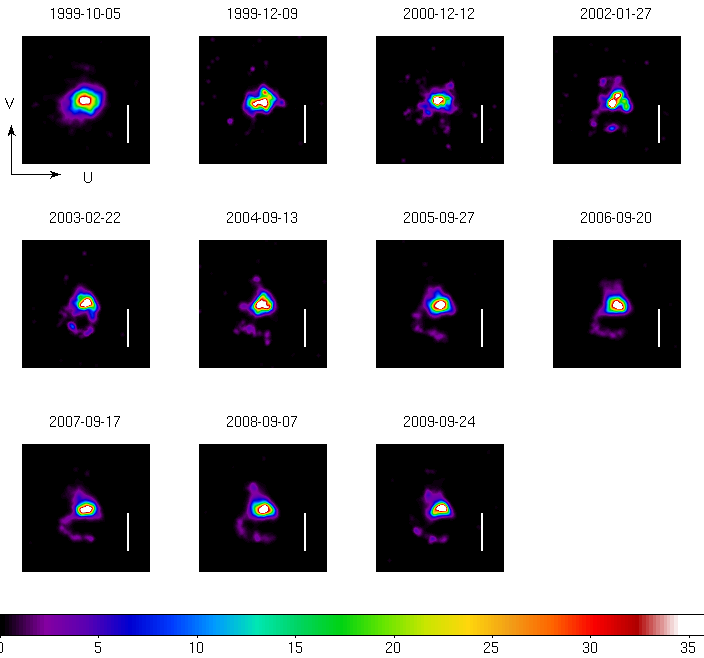 Deconvolution of observed source image with ray-trace image for the AR Lac calibration observations. The vertical white bar is 1 arcsec in length. By the 2002 observation a hook-shaped extension to the -V direction has appeared. This feature appears to be stable over the last several years. The orientation is in HRC-I instrumental U-V coordinates. Figure from Chandra's Ultimate Angular Resolution: Studies of the HRC-I Point Spread Function by Juda & Karovska. Similar to Figure 1 but for Capella calibration observations that translated the HRC-I behind the telescope aim-point. The offset position is indicated above each panel. The offsets are large enough that the dither samples non-overlapping regions of the detector. The same hook-like feature as seen in the AR Lac data is observed. The orientation is in HRC-I instrumental U-V coordinates. Left - AR Lac HRC-I observation (2009 Sep 24, ObsID 10578) deconvolved with the simulated PSF showing several sub-arcsecond features including a significant asymmetry, an arc-like structure (6% from the total brightness), centered at ~200deg at 0.8", measured counterclockwise from the +DETY axis. The image was smoothed for visual purpose, to show better the asymmetry. The image has been rotated through the roll angle so that the axes are parallel to DETX,DETY (ignoring the effects of dither). 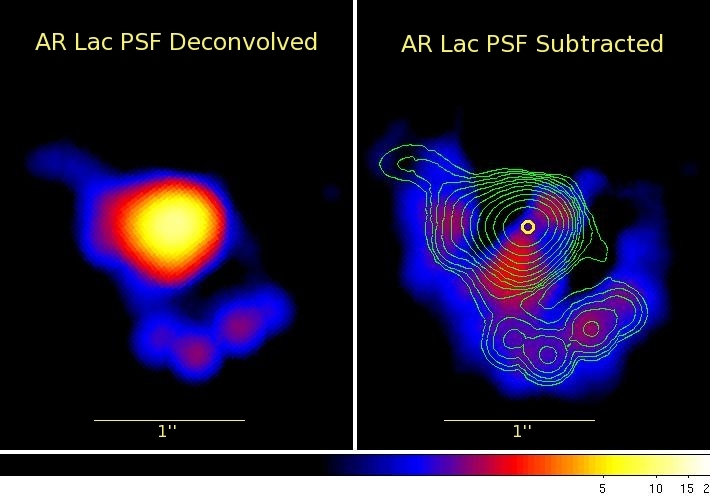 Right - The PSF subtracted original AR Lac observation showing similar structures as in the deconvolved image, and especially the arc-like asymmetry at ~0.8". Additional asymmetries are noted but at a scale less then 0.5" which require further investigation. Similarly to the deconvolved image , the subtracted image has been smoothed for visual purposes. Left - ACIS-I tau CMa observation deconvolved with the simulated PSF smoothed with gauss (pixel size 0.1") showing asymmetry in the same direction and spatial scale as in the HRC-I observation to the right. Right - AR Lac HRC-I observation (2009 Sep 24, ObsID 10578) deconvolved with the simulated PSF.